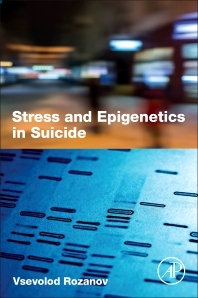 Stress and Epigenetics in Suicidediscusses the central role of epigenetic modifications in suicidal behavior. As early-life stress and an individual's ability to cope with such stressors, combined with psychological factors, social factors, and existential and cognitive factors can predispose young people to suicidal behavior and put them at added risk of suicidal behavior later in life, this book provides readers with an overview of the neurobiology of stress, an introduction to the epigenetic changes induced by stress, and an understanding of how vulnerability and resilience to stress are built. It integrates these mechanisms into a biobehavioral model of suicide based on epigenetic marks, gene-environment interactions, and other stressors. More importantly, it provides future direction for research and discusses potential interventions. This book is an ideal and trusted resource for researchers and clinicians who are interested in learning how the environment can affect behavior through genetics, and for those seeking the development of new methods for suicide prevention. Youth suicides—is it really growing worldwide? Youth mental health problems—are they growing too? Chapter 3: What Is Epigenetics? Is It Transgenerational? Professor Rozanov has an extensive research background in clinical biochemistry, neurology, and mental-health promotion and suicide prevention. His interests in neurochemistry and the neurobiology of behavior have led investigations into diverse types of stressful situations and the pathways of metabolic brain protection under these conditions. He has also been involved in numerous studies of the biological bases of suicidal behavior, including one of the largest global genetic studies of suicide attempts ever undertaken. In addition to his academic appointments, he is also the Ukraine representative in the International Association of Suicide Prevention (IASP), a member of the suicidology section of the European Psychiatric Association (EPA), and chair of the section of military psychiatry of the World Psychiatric Association (WPA).